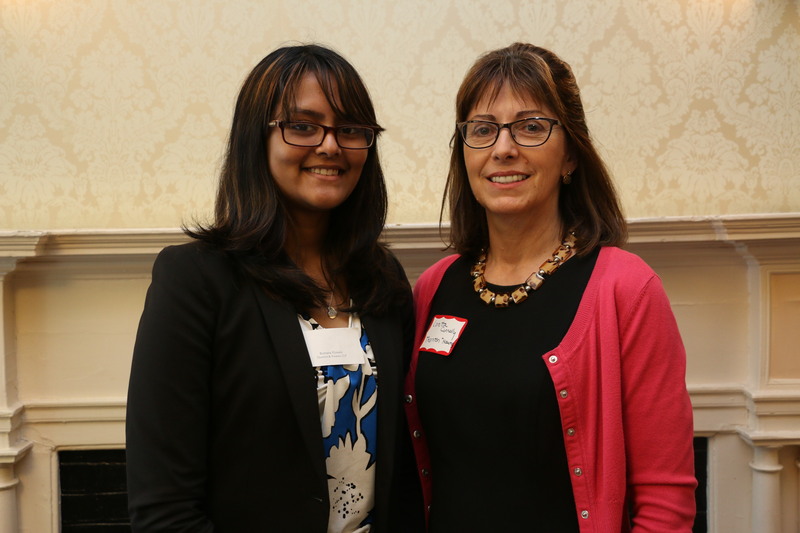 Thornton Law Firm LLP said goodbye to their BBA Summer Jobs intern Romana Hussain on Friday. Romana is heading back to Boston Latin Academy for her junior year of high school. We’re not the only ones who miss our BBA Summer Jobs students. Firms and law offices took to social media to express thanks and well-wishes to their departing students on Twitter. It’s easy to understand why – students were energetic, friendly, and eager to learn and help with a range of tasks in the office, including data entry, filing, and scanning. Lucidey Pimental and Myntah Morris interned at Burns & Levinson LLP through the BBA Summer Jobs Program. The BBA Summer Jobs students bid their law offices goodbye on the final day of their eight week internships. 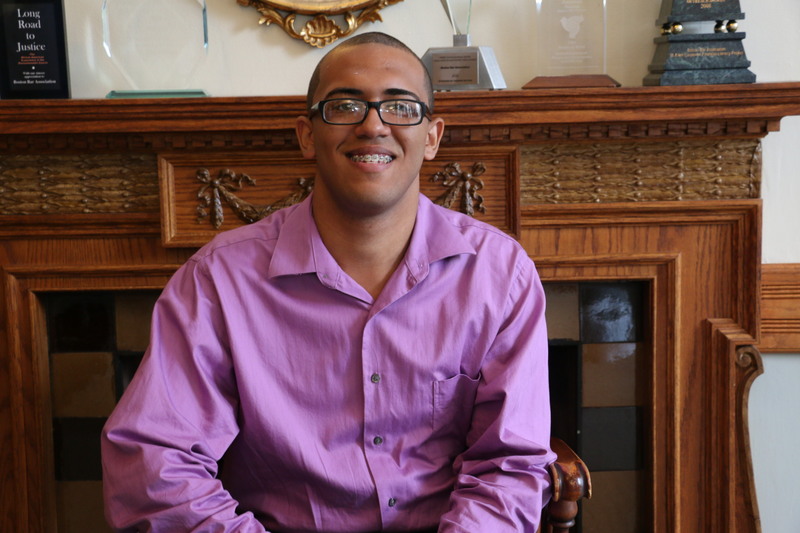 Beyond the Billable wanted to take this opportunity to thank the employers who demonstrated their commitment to the Boston community and its future by hiring a Boston high school student. These employers not only provided the students with a means to earn a paycheck, but they offered the students opportunities to develop professional skills and exposed the students to the legal field. If you saw this Boston Globe article last week, you know the Mayor fell short of his goal of 12,000 jobs for Boston youth. The Boston legal community should be proud that we increased our support for Boston teens by funding 64 positions this summer—up from 58 positions last year. That said, it’s clear that more can be done to support our youth and we hope the Boston legal community will continue to step up next year and provide even more summer jobs. ++This year the Boston Bar Foundation’s M. Ellen Carpenter Fund will be funding summer jobs for 14 Boston Public Highs School students at public agencies and nonprofits this summer. Learn more about the fund here. Ben Haideri, a recent graduate of Boston Latin Academy and intern at the Suffolk County District Attorney’s Office, spoke with the audience about his experience in the program. “Thomas Hobbes once stated that “The law is the public conscience.” The law in general is an amazing enigma because it morphs to reflect society while at the same time being one of the few places to turn towards for an unwavering base in an ever-changing world. I personally have had the great pleasure of seeing law in live action while working with the District Attorney’s office at the Dorchester Court. Almost every day, I was able to watch all sorts of legal events from civil disputes to full trials during my time. I read through and summarized cases, ordered evidence, and much more. I also had the pleasure of seeing some of the brightest legal minds from both sides at work. Not only did I get to see the gears of the legal world turning, but I also faced the calming realization that those behind the gears at the District Attorney’s office are some of the kindest, hardest working, and most motivated people I have ever met. An example being Christina Miller, who has been a mentor of mine for the past two and a half years, since my time on the Mayor’s Youth Council. A woman whose job is about as far away from a 9-5 as possible, Ms. Miller is an Assistant District Attorney, but it does not end there. She is a leader in the Boston legal community, and dedicates much of her free time to giving back to the community as a whole in many different ways. She is a prime example of how the law doesn’t begin or end in a courtroom, rather, many times, is dictated by the temperature of a community. Because of this and through what I witnessed day in and day out at the court, I have been reminded both not to take for granted the laws that we have in place while also to keep my eyes open to the changes that are necessary for the betterment of society. Hat’s off to Ben for a great two years (and an excellent speech) and all the students who participated in this year’s program! The fourteen BBF funded Summer Jobs students have spent their summers working at legal service and government agencies. As you learned from this article last week, the BBF funded Summer Jobs students have gained essential skills and also served as valuable assets to their organizations this summer. While the students wrap up their summer jobs tomorrow, we wanted to bring you another look at what three additional BBF funded students have been up to this summer. Job Responsibilities: Sarah has been working on a number of projects with the Massachusetts IOLTA Committee, including updating the organization’s manuals and handling incoming calls from the public. Her largest project has been to assemble a historical legal services timeline by scanning press articles and documenting all media coverage of the organization from 2000 to 2006. Job Responsibilities: At the Executive Office of Health & Human Services Marley has handled key responsibilities including archiving tort litigation files, researching cases, preparing files for court, and handling the front desk. She has also been working on a project dealing with ‘ancient’ files in order to move forward old cases. Job Responsibilities: At LARC, Noime works with the intake team where she handles tasks such as inputting information into the organization’s database, preparing documents and forms, and making calls to senior citizen clients. Noime has also provided invaluable benefits to the intake team as a result of her impressive multi-lingual abilities, by translating English to Cape Verdean Creole, Portuguese, and Spanish. Noime says: “My favorite part of my work is translating English to Portuguese, English to Spanish, and English to Cape Verdean Creole. This summer, I also enjoyed the finance enrichment seminar we took that discussed financial aid and how to use your credit card”. 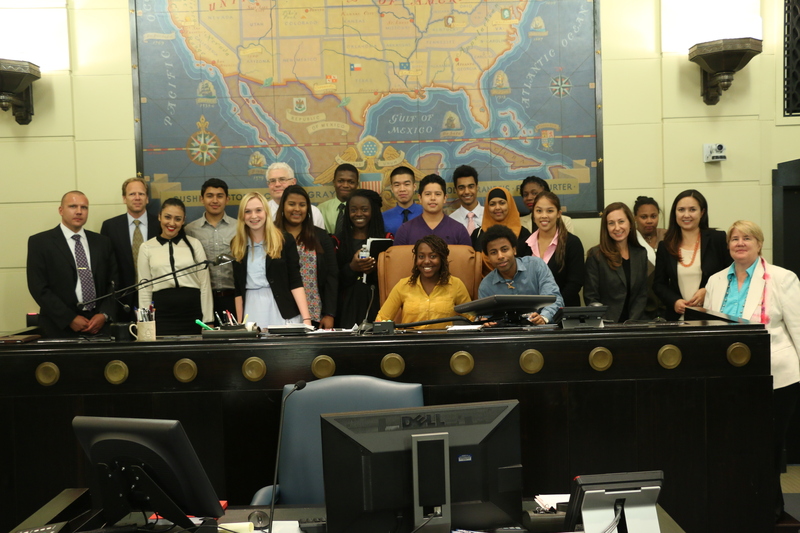 Judge Feeney showed the BBA Summer Jobs students how the court’s computer system worked during their fieldtrip to the U.S. Bankruptcy Court. This summer, the BBA Summer Jobs students and the Nelson Fellows of the U.S. Federal District Court took yet another field trip to visit Chief Judge Bailey and Judge Feeney’s courtrooms at the Boston Bankruptcy Court. The trip to Bankruptcy Court was the final portion of the M. Ellen Carpenter Financial Literacy Program, which was folded in to the students’ weekly enrichment seminars. Through the Financial Literacy program, students were primed on how to budget, use credit wisely, and finance a car, and this final session gave them a glimpse of what happens if they make poor financial decisions from inside the courtroom. This fieldtrip marked the end of the BBA Summer Jobs weekly enrichment seminar series, which included a mock City Council meeting in Boston City Council chambers, a “speed dating” session where they heard from lawyers of three different backgrounds, a trip to the John Adams Courthouse, and much more. The Nelson Fellows participated in the Consequences session with Chief Judge Frank Bailey. 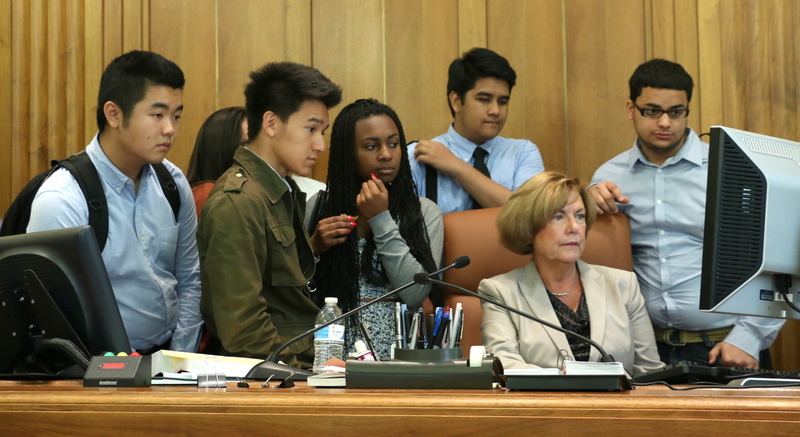 The BBA Summer Jobs students visited Judge Joan Feeney’s courtroom at the U.S. Bankruptcy Court for the final session of the M. Ellen Carpenter Financial Literacy Program. 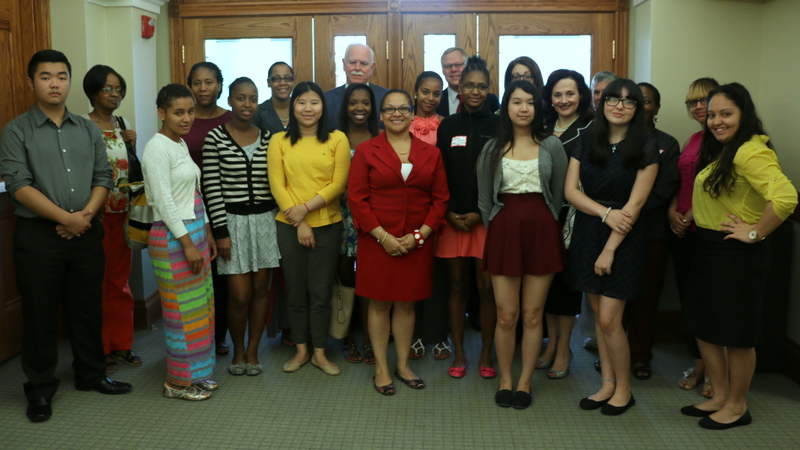 To culminate the Summer Jobs Student’s program, the BBA hosted a ceremonial event to congratulate the 64 Boston high school students on their hard work this summer. While the students still have another week of work at their internship before they head back to school, the ceremony brought together the students, their families, and their employers to celebrate their achievements. Summer Job star Ben Haideri spoke about his experience interning at the Suffolk County District Attorney’s Office during the past two summer, and keynote speaker, Christina Miller, the Chief of District Courts and Community Prosecutions for the Suffolk County District Attorney’s Office, gave the students advice on how to continue to build their professional careers after this internship ends. BBA President Paul Dacier, congratulated the students on their accomplishments this summer and then jokingly quizzed the students on their knowledge of the U.S. Constitution. 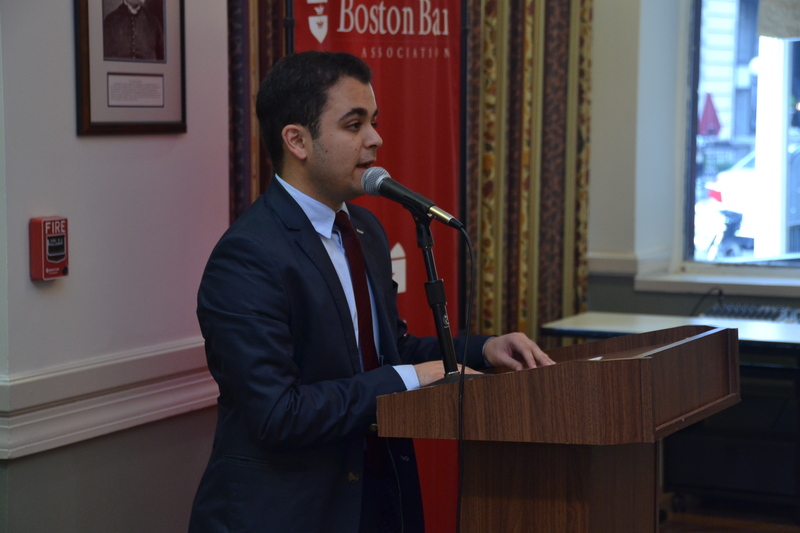 Recent Boston Latin Grad Ben Haidieri eloquently spoke to attendees about this past two summers participating in the BBA’s Summer Jobs Program and how his experiences working for the Suffolk County DA’s Office has contributed to his career plans. Summer Jobs Intern Jose Maria, from New Mission High School , posed with his family at the Summer Jobs Celebration following his successful internship with Edwards Wildman Palmer LLP. Kylie Webster-Cazeau, from Boston Latin School, showed off her certificate with her family at the Summer Jobs Celebration. Kylie spent the summer interning at the Federal District Court, working in one of the BBF’s funded positions. Katie D’Angelo, the BBA’s Public Service Program Coordinator who runs the BBA Summer Jobs Program, along with Sonia Shah, the BBA’s Public Service Manager, posed with Alejandra Bautista and Hermuna Taib, the BBA’S two interns, who have worked tremendously hard and helped almost every department at the BBA this summer. Daniel Forster, Student Financial Services at Simmons College, came to the BBA to talk to the Summer Jobs Students about the importance of understanding student loans. As part of the weekly enrichment seminars of the Summer Jobs Program, Daniel Forster, the Assistant Vice President of Admission and Student Financial Services at Simmons College, met with the students to give them the run down on student loans, loan payments, financial aid, and scholarships. The students listened intently through the enrichment seminar and had no shortage of questions when it came to finding out the best ways to pay for college — and to repay their loans. During the enrichment seminar, Daniel walked the students through how to read an award letter to introduce them to the oftentimes confusing financial information. In addition, Daniel passed out a sample student loans calculator and taught them the best way to calculate a monthly loan payment and the total interest paid. Alejandra Bautista was one of the many students who asked thoughtful questions of the Speaker Daniel Forster. Next week, the Summer Jobs Students will be finishing up their Financial Literacy portion of the enrichment seminars by taking a trip to the US Bankruptcy court for a session on consequences, so stay tuned! The Summer Jobs Students who are working in positions sponsored by the BBF at our Summer Jobs Orientation in June. With the end of summer in sight, we are taking the opportunity to catch up with Summer Jobs students funded by the Boston Bar Foundation. You’ve already heard where the 14 BBF students are working this summer, but we wanted to offer our loyal readers a closer look at what they have been working on this summer. Take a look below to hear about three of the interns’ current projects and their takeaways from their internships so far. Job Responsibilities: While working at the Department of Labor Alexandra has concentrated on several different projects. One of her first projects was to identify and sort records in accordance with the Statewide Record Retention Schedule. She has also been focused on improving the agency’s webpage by updating information and adding links to resources. Her most recent project included making the website more accessible to reading-impaired constituents. At her internship, Alexandra also got to witness Massachusetts history when she witnessed the Governor signing the Domestic Workers Bill of Rights. Job Responsibilities: Cesaltina’s experience at the Committee for Public Counsel Services has centered on criminal cases. She has been responsible for opening and closing criminal cases, handling database work, drafting subpoenas, scanning police reports, operating the switchboard, and much more. Tina has also had the opportunity to attend court sessions, and observe criminal justice in action. Job Responsibilities: At the U.S. District Court, Hannah has been observing court cases, cataloging and organizing files, and editing memos. Hannah is also the coordinator for the Ward Fellowship where she is in charge of projects, such as scheduling and confirming meetings with various public servants and organizing an annual trip to Washington D.C. In addition, she assists the Honorable Judge Mark L. Wolf by editing memos and working with law clerks. Stay tuned to meet the other BBF funded students. The BBA’s Summer Jobs Program enrichment seminars continued this week with an exciting take on “speed dating,” which rapidly introduced students to a variety of legal careers. At “Exploring Legal Careers,” the Summer Jobs’ students formed small groups for sessions with three different attorneys: Manisha Bhatt, a Senior Attorney working at the Family Unit of Greater Boston Legal Services, Adam Foss, Assistant District Attorney in the Juvenile Division of the Suffolk County District Attorney’s Office, and Colin Van Dyke, an Associate at Mintz, Levin, Cohn, Ferris, Glovsky and Popeo, P.C. This enrichment seminar gave Summer Jobs students an opportunity to hear firsthand what it’s like working in a big law firm, at a legal services agency, and as a prosecutor. Armed with bios and sample questions, the students had 15 minutes to grill the attorneys about their careers and lives. Manisha Bhatt spoke to the students about how it is important to find a career you’re passionate about, such as her work in family law at Greater Boston Legal Services. Adam Foss captivated the students with his explanation of his work as a prosecutor and the importance of understanding why people commit crimes, and Colin Van Dyke explained what it is like to work for a large law firm in Boston, answered questions about his environmental law work, and also entertained the students with stories about his chickens. “I thought today’s enrichment seminar was really good. We got different perspectives from people who work in different fields of law. I thought the most interesting part of today’s seminar was when we talked about working with juveniles. Adam talked about how our mind works and how our brains aren’t really done developing and how that affects the minds of people who commit crimes. 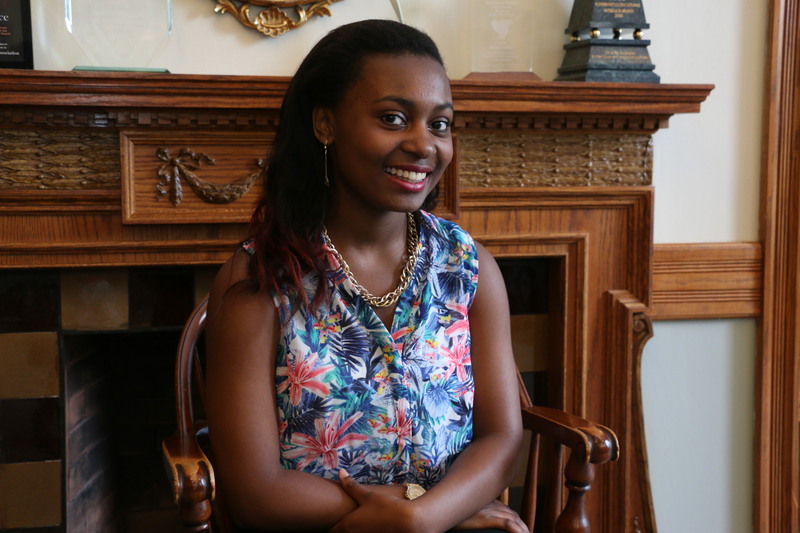 “– Kylie Webster-Cazeau, a rising junior at Boston Latin School , working at the Federal District Court this summer. “I thought that today’s enrichment seminar was really informative and really interesting. We got a perspective of different types of law, which we haven’t gotten from our law firms. The most interesting thing I learned today is that actually there are two different types of prosecutors, and I found that really interesting because I always thought of a prosecutor as just someone that puts people in Jail.” Jerry Rodriguez, a rising junior at Boston Latin Academy, working at Nelson Mullins Riley & Scarborough LLP this summer. Manisha Bhatt (Greater Boston Legal Services) explained what it means to be a legal services attorney and encouraged the students to find work that they are passionate about. Colin Van Dyke (Mintz, Levin, Cohn, Ferris, Glovsky and Popeo, P.C.) had the students laughing with stories about his chickens after he told them about his environmental law work and careers at large law firm. 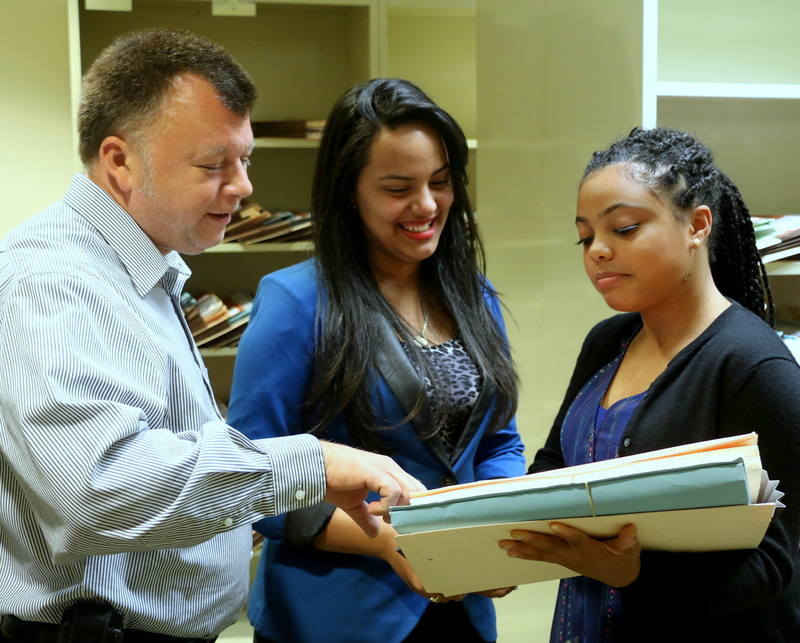 As you may remember from this article, the Boston Bar Foundation funded 14 Boston public high school students to work in legal service and government agencies through the BBA Summer Jobs Program with the help of Boston law firms. In addition to money allocated from the Foundation itself, local firms donated to the BBF to help support a summer job. This morning, the sponsoring firms had the opportunity to hear first-hand from the students at the BBF Summer Jobs Breakfast, where the students shared stories of their experiences going to court and helping with large office projects. Students and supervisors from LARC, the Committee for Public Counsel Services, and the U.S. Bankruptcy Court discussed their experiences in the BBA Summer Jobs Program. Supervisors and students from the Department of Labor Standards, Massachusetts IOLTA, Suffolk County District Attorney’s Office, and the Massachusetts Executive Office of Health and Human Services told BBA Public Service Programs Coordinator Katie D’Angelo about their internship highlights. Cesaltina Barros, who is interning at the Committee for Public Counsel Services in Roxbury, told Michael McDermott (Dain, Torpy, Le Ray, Wiest & Garner, P.C. ), who’s firm sponsored a student this summer, BBF Director of Marketing & Development Megan Leppert and her supervisor, Keisha Taylor (Committee for Public Counsel Services), about her experience. The interns and supervisors at Massachusetts Law Reform Institute and Volunteer Lawyers Project discussed their job responsibilities with BBF Trustee and BBA President-Elect Julia Huston.